2. Place cut fries into a large bowl and cover in beer. Set aside and allow to marinate for 15 minutes. 3. Drain beer and toss with garlic, oil, salt and pepper. 4. Place fries in a single layer on a silpat-lined baking sheet. Bake for 30-45 minutes, or until browned and crispy. Serves 2, if you are lucky. I don’t like the taste of beer either! Though I do definitely cook/bake with it on occasion. 🙂 I need to try these fries! I have three beers in the fridge that I need to use up and feel like I need a change from beer bread. You will love these, Joanne. I know it! Could you taste the beer in your chili? I know that when I made the beer bread, there was a hint of beer in it. Ah! I remember meaning to make this when I first saw it on EP. Thanks for the reminder! Wow—I’ve been mentioned in your blog! Best “fifteen minutes of fame” I’ve had. I knew you’d love the fries. Wasn’t sure how they would be as sweet potato fries, but will now attempt them. 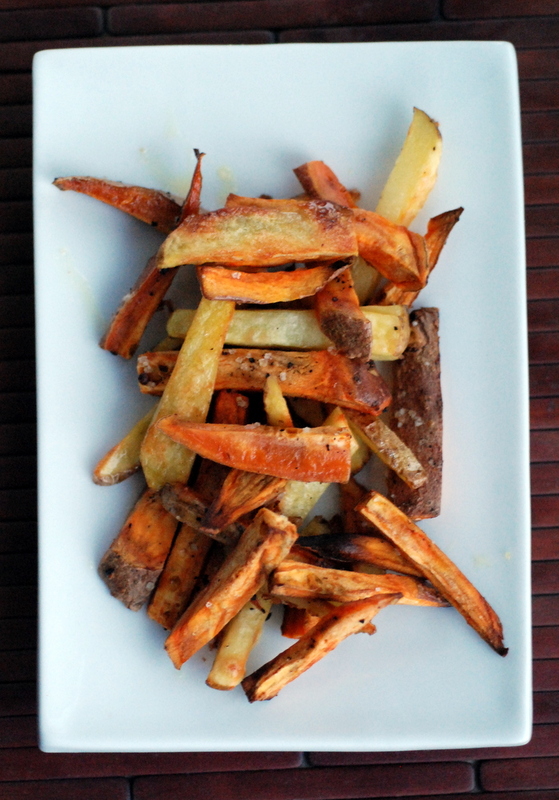 We recently made a blogger’s recipe for crispy sweet potato fries. Still not crispy like actual fried potatoes, but delicious nonetheless (used a little oil and cornmeal). I actually just tried a double chocolate cherry stout, I loved it. I think me and Rob have similar tastes! I love this use of beer too! There’s something about fries from restaurants that you just can’t replicate at home, or maybe until now that is. Totally trying it! So glad you posted this one 😀 I mentioned the recipe to my Dad, and now he, along with my brother and even my boyfriend, really want them 😀 on the list for next weekend!! Thanks!! I’ve heard great things about the chocolate cranberry stout but haven’t tried it; Muskoka’s one of our favourites though! I’ve also tried the spruce beer that tastes like a Christmas tree – so weird! I’ve never heard of soaking sweet potato fries in beer but it sounds fantastic, will have to give this a try! I think he also really liked the Bare Naked Ladies beer (from the LCBO). Cask Days is really great. If you like interesting, different, and well-crafted beers, it is THE place to go. These fries sound really interesting! We do baked fries pretty frequently, but have never added beer–now I can’t wait to try this method out. I’ve slowly grown to like beer over the last few years, but I haven’t tried baking or cooking with it yet. Beer and fries are a good combination when paired together, so soaking fries in beer sounds like a good idea to me! I’ve heard of soaking potatoes in water first before baking to make crispier fries, so this sounds like a similar concept, but it adds flavour at the same time! Oh my dear lord. These sound amazing! Beer–who knew? The hard part will be getting The Husband to let go of the beer. But we’re definitely trying these! 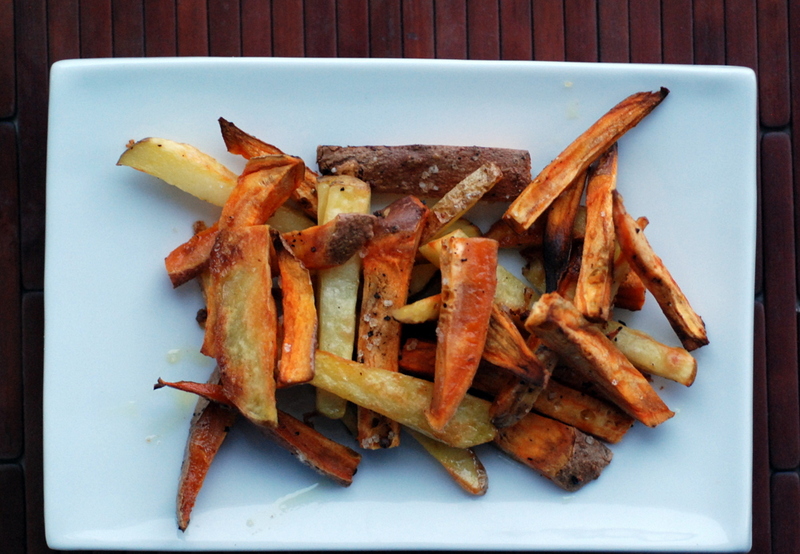 I have been a fan of sweet potato fries for a long time and am very excited about trying this version. They look fab and I am of the opinion that adding beer will just make them better. Thank you for entering the No Waste Food Challenge. 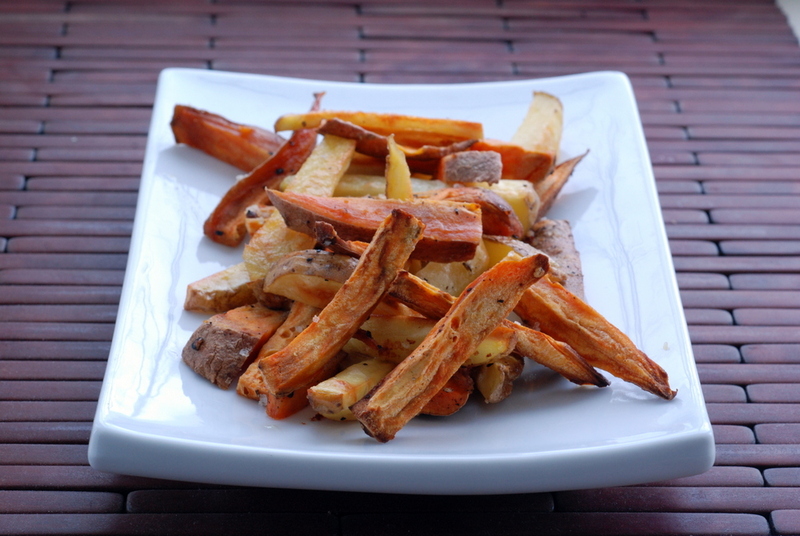 Love sweet potato fries, and bet they’d be even better following this recipe to soak them in beer. And black beans, let me count the ways I love black beans. Although ANY beans from Rancho Gordo are my favorites. I bought their 20-lb. deal pack back in November. And get giddy at the thought of which ones I should prepare next!